From now through the month of December I will be introducing you to a series of crock pot gifts (hence the Jingle Bell Crock you see at the top of this page). Some gifts will be able to be made in the crock pot, some will be given with instructions on HOW to make them in the crock pot. You will see many that I’m making myself, but I’m also going to share some crock pot finds from across the web that are gift worthy. I love letting my crock pot continue to make my life easier, and gift giving was just a natural place my mind went to when I anticipated this holiday season. The first crock pot gift that I ever made was a salted caramel sauce. When I initially made it was in the summer time and I suggested using it for an ice cream topping. If you’re anything like me you know that there are many occasions that require a good salted caramel sauce… for dipping fruits, pretzels and cookies into (and the occasional bare finger… just sayin’! ), for drizzling over a warm cake, for adding to your morning coffee… the list could just go on! 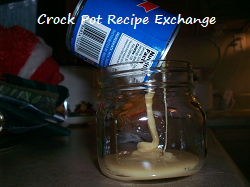 Start by emptying an entire can of the sweetened condensed milk in each of the jars. Use the fourth can to top off and completely fill the jars. Make sure you leave at least 3/4 – 1 inch of space at the top of each jar. 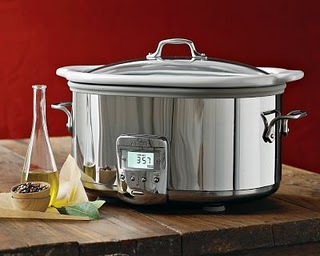 In the meantime, place a dish cloth in the bottom of your crock pot for the jars to rest on. Add a couple of cups of water to crock pot. Wipe any condensed milk and salt from the rims of the jars with a clean wet cloth. Place the flats and tighten the rims on each jar. Place the jars on top of the dish cloth in the crock pot. Make sure they are not touching. If you need to add water to completely cover the jars do so now. Put the lid on the crock pot and turn your crock pot to high. Watch for the water to start to boil. You will notice bubbles around the edges. My glass lid started to do a little dance too. 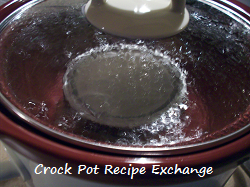 Once the water starts to bubble let it cook for 2 – 3 hours. Just know that the longer it cooks the thicker the sauce will become… will actually be more like a dip. When done, carefully remove from the crock pot with a pair of tongs, using an oven mitt to hold the bottom once you get it completely out of the water OR a pair of jar lifters (if you’re a canner, you know what these are). Place on a folded dish towel to let cool completely and make certain it is out of the way of any breezes or drastic temperature changes (you don’t want the jar to break while it’s cooling). For gift giving wrap a nice ribbon around the jar and label what it is with a tag or a nice sticker. You could also wrap the entire jar with tissue paper and use ribbon to secure it just under the lid of the jar. This will last for 4 – 7 days. Once opened it needs to be refrigerated.